I am passionate about hearing God and for others to learn his voice, too. God lead me to some wonderful ladies through the Allume Conference, who are brave and bold and willing to share their story of how they have come to hear the voice of God through this series. It is not a list of "how tos" or of verses on hearing God or things of the sort. Just an honest, open discussion of their journey to the place where they know God's voice. Praying you are encouraged through their story and steps of faith. For the last year and a half I have been reading the Bible, studying, and listening to sermons by various Pastors. I've learned that God does speak to me when I take time to be alone with Him and listen for His response. In 2014 when I first started spending time alone with God, I dedicated a specific room as my secret place where I could have quiet undisturbed time with God. I prayed asking God to bless me with the ability to hear His voice, as I wanted to take my relationship to another level of closeness, and deeper understanding of Him and His Word. Soon after, I started being awakened around 3 am in the morning for many months (I still get awakened, but not as often). I hear my name being called. I literally hear an audible and very distinct voice. I receive messages and specific words and told to write them down. I am very prayerful, asking the Lord their meaning. I look forward to spending time with God in my secret place. I sing, read my Bible, and pray. I then lay quietly and listen as my Father speaks to me through the Holy Spirit, writing down all He has to say to me. My relationship has gone to another level with God. I hear from Him each time I seek Him and listen for His response. I have learned that God speaks to me in many ways through the Holy Spirit, family, friends, Pastors and songs. Sue is a wife to her music loving husband, Greg, the creator of Spirit Stream Radio, and mother of seven children (all adults). She has always had a heart to seek and follow God. She enjoys biking, hiking, kayaking, and spending time with her family, especially her precious Grandchildren! Hearing and Recognizing the VOICE of God in My Life. 14 But if ye have bitter envying and strife in your hearts, glory not, and lie not against the truth. 15 This wisdom descendeth not from above, but is earthly, sensual, devilish. 16 For where envying and strife is, there is confusion and every evil work. 17 But the wisdom that is from above is first pure, then peaceable, gentle, and easy to be intreated, full of mercy and good fruits, without partiality, and without hypocrisy. 18 And the fruit of righteousness is sown in peace of them that make peace. Just in the simple matter of being asked to guest post here was a case of hearing the voice of God. Tiffany sent me an email on December 1st asking for me to guest post about this subject. I remember reading it and then flagging it in my email thinking I would get back to it later. I sat cleaning out my inbox and ran across it again. I quickly emailed Tiffany and asked if it was too late to submit a post and she replied graciously with an extended invite. That reply was on February 10th. I had no idea what I was going to write. However, that evening as I sat in our Wednesday night Bible Study, though what was being taught was completely on a different subject, the Holy Spirit quietly whispered, "that thing I showed you in James a few days ago, THAT is what you are to share in that post on Tiffany's blog." On February 2nd, I had one of those times in my morning devotions that I knew it was all God and I was just writing what was coming to mind. Wisdom that was not coming from within me. The Holy Spirit revealing the meaning behind the words as I read them, an understanding and application of the passage, so much clarity and I couldn't write them down fast enough. Ever have a time like that? It's like an "ah-ha" moment that you KNOW didn't come from your own brain. I remember writing it all down and then sitting back and going, "Wow, God. What is this for? What am I to do with this?" Though much of it was gently correcting me spiritually (I had a bad attitude about something) but it is also a good lesson to pass on. Certainly we all deal with this, it isn't just me. So, back to James chapter 3. Here is what God gave me. Let's start with verses 14-16. When my thoughts are critical and judgmental and hypocritical, they are not from the Lord, they are not Holy Spirit led. They have not "descended from above." They also tend to be loud and consuming thoughts. Then in verses 17-18, God describes that which has "descended from above" as "first pure, then peaceable, gentle, and easy to be intreated, full of mercy and good fruits, without partiality, and without hypocrisy." When I am listening and the still small voice of the Holy Spirit is truly speaking, then those thoughts are pure and peaceable, gentle and "easy to be entreated," full of mercy and good fruits, without partiality and without hypocrisy. Prevailed on by urgent solicitation; consenting to grant what is desired. It is easy to consent to. It is not asking the impossible. God does not ask the impossible of us and he gives us the ability to do what He asks of us. They are thoughts that in the end will lead to peace, they are merciful thoughts and thoughts that will produce "good fruits" and "righteous fruits," if they are applied. They also do not contain the sins of partiality and hypocrisy. Also these thoughts are usually corrective thoughts, correcting my own behavior or attitude. The Bible refers to the voice of God as "a still small voice" in 1 Kings 19:12. It is a quiet whisper. He whispers it and then leaves you with it to ponder. It is NOT a loud and condemning thought that puts itself on repeat in your head, that wears you down, and piles on the guilt, making you miserable. What a blessing that God, through the Holy Spirit living within us as Christians, is so loving and gentle with us. He teaches us in gentle ways much like I imagine how Jesus took little children on his knee and spoke lovingly to them. I don't think he grabbed them forcefully, got in their face, and yelled at them. Is God whispering something to you today? Be still and quiet and listen because he will not yell at you above the noise in your life. That is simply not his way. Sharon writes about her hike through life at her blog Hiking Toward Home. She enjoys sharing what her Trail Guide teaches her along the trail toward her home in Heaven while capturing the view in pixels, paint and pencils. As wife to the love of her life, whom she met in a college photography darkroom and home educating mom to four fabulous kids, her trek often feels more like a marathon sprint up a mountain than a leisurely hike. Her writing has been featured at (in)courage and in Holly Gerth's book You Were Made For A God-Sized Dream. Hike along with her through Instagram, Facebook, or Twitter. It is hard for me to stand still, sit still, or just be still. I am one of those people that tend to have two speeds: energizer bunny or asleep. It’s as if I have a battery and I just keep going until my battery dies. Not only do I physically have trouble being still, but my mind has the same problem. When I ask someone what they are thinking and they say “nothing” I have a hard time believing that…because my mind is never off. I am constantly thinking…whether I mean to or not. You should hear some of the story lines that run through my mind. I am sure there is a blockbuster hit somewhere in there. But, seriously, I think and think and think. Sometimes it is worry, but most often it is just wondering. Especially when I am waiting on the Lord. Am I following God’s call? And then I read 1 Samuel 12:16, and I am reminded to be still. That the Lord is doing a great thing. That this great thing will happen before my eyes. I am reminded that I need to quiet my mind and my heart and just listen to the Lord. I have to block out everything else going on outside of me and inside of me, and focus on the one who made me and has the perfect plan for my life. Even when I want to move ahead of Him, I know that this would be outside of His will. And the best and safest place to be is at the center of His will…so why should I stray? Why should I move ahead of Him? Why shouldn’t I stand still and see the great thing the Lord is doing right before my eyes? It’s so tough, but I strive to make this time of listening a priority. Instead of turning immediately to my phone first thing in the morning, my goal is to turn to God’s word. Instead of flipping on the t.v. before bed, my goal is to turn to God in prayer. Throughout the day when I am wondering and worrying, instead of texting a friend, my goal is to seek the Savior. It’s taking these small moments throughout my day when I wake up, before a meal, as I lay down for bed, and many times in-between, to turn to the great counselor for guidance. These are the times to stand still. Listen, the words of 1 Samuel 12:16 was not written to me or about me, but I believe it applies to me. And I believe it applies to all of us at varying times in our lives. As I am waiting on the Lord to move in different areas of my life, I want to just be still and trust Him, knowing that He has a great thing waiting for me, and it will happen before my very eyes. I need only stand still. It is not a list of "how tos" or of verses on hearing God or things of the sort. Just an honest, open discussion of their journey to the place where they know God's voice. Praying you are encouraged through their stories and steps of faith. "You've been living with a thorn in your side, and it has kept you from truly living. I'm going to remove it, and it will set you free to live a life of joy." Nothing about that morning had been extraordinary other than the fact that I had gotten to work 10 minutes early (which was a feat for me). With time to spare, I thought I’d have a little Jesus time before I started my shift. Over the past few months, I’d been exhaustingly busy as a newlywed in a new city. So moments spent with God were far and few in between. A CD with the song “How He Loves” by David Crowder Band serenaded me as I began to pray in my car. And so I did. All of a sudden, he showed up. He filled me all the joy I'd experienced in my marriage and reminded me that that was a gift from him. I was so overwhelmed with His love, I could practically feel him saying "Jeana, I love you so much! This is a blessing from me.” His love was like a hurricane, as the song says. Then he showed me my hurt from the past and present. My anxieties that left me cynical and paralyzed with fear. My tears of joy turned into tears of hurt, like Jesus was lifting up a bandage on a wound I've tried to hide. And he spoke very clearly into my spirit, promising to remove the thorn and bring restoration into my life. Over the next few months, I entered a season of rest and healing. My mornings began with a coffee date with my Creator. Just me and him. Just my bible and some worship music. His Word became alive in my life, speaking loud and clear into my soul. Whether it was 10 minutes or 2 hours, I remembered that I needed to let my Jesus speak to me, no matter how long it took. And really, it’s been like any other friendship. The more time I’ve spent with Him, the more I’ve enjoyed His company. I was shy at first; at least compared to how much of my life I offer Him now. As I’ve learned to sit in His presence, He’s walked me through tears of joy and pain and healing. I’ve learned to discern the sound of His voice, and now I recognize it throughout my days, guiding me. It’s the voice that comforts me as if a hand is intertwined in mine. Learning to listen to my Jesus in solitude has brought more than just healing into my life. It has taught me how to live by the guidance of the Holy Spirit, releasing me from many fears that I’ve struggled with for so long. He’s removed my crippling thorns and sins, making me whole. Tuning our spirits to hear Jesus allows us to do what we were made to do: to live in freedom through fellowship with our Creator as He restores and reconciles us to Him. Jeana is a dreamer, an artist, and a writer. (She makes a living doing two of those things.) Jesus has healed her fragile heart, and He's the reason she’s able to live a life full of joy and wonder. When she isn’t painting, baking, or glued to her laptop, she is outside soaking up the sun and traveling to new places with her wonderful husband. You can find her blogging at The Slow Artisan and over on Instagram @theslowartisan. Stephanie is a wife and stepmama of two. The goal of her blog is to encourage women as they seek to grow in their faith while balancing the struggles of home, life, family, work, and the myriad of demands of our time and attention. She and her family live in North Carolina and enjoy all the state has to offer from the mountains to the beach.You can find her on Instagram, Twitter ,Pinterest. I was around age fourteen when I can first remember knowing God was speaking to me. I attended a small church with a very close-knit youth group. Several of the kids were struggling with knowing their salvation was real, and it caused me to have doubts. I finally sat down with my Bible and so, "OK God, I need your help with this. I know what I believe, and I don’t want to struggle with this anymore." I opened my Bible and read Mark 9:29. A man has brought his son to Jesus to be healed. The man asks Jesus to have compassion and help the boy if he is able. In verse 23, Jesus responds, "If you can! All things are possible for one who believes." And then, in verse 24, the man responds, "I believe; help my unbelief!" I felt just like this father. I knew I believed, but the doubts of others had caused me to question myself. That day, I gained such a strong assurance and knew I never needed to question the sincerity of my faith again. For me, hearing the voice of God has always come through my involvement with Scripture. 2 Timothy 3:16-17 tells us, "All Scripture is breathed out by God and profitable for teaching, for reproof, for correction, and for training in righteousness, that the man of God may be complete, equipped for every good work." I have absolutely found this to be true. God has provided His timeless Word to speak to us. The Holy Spirit identifies how it needs to affect our lives. At times, I personally identify with characters in the Bible. Their struggles reflect mine, and I gain a better understanding through their experiences. Other times, a verse may strike me in completely unexpected ways, leading me to examine how I behave or think and fostering within me a desire to change in ways that I know are inspired by God. I have always struggled with making Bible-reading a daily habit, but as I have committed more of my time to it, I am amazed at how it has affected my life and how the words have truly come alive. The Bible provides endless conversation with God, because even when I read the same passage twice, I can feel led to identify different personal applications. While the Truth never changes, my understanding can certainly grow. I am so grateful that God did not leave us to figure out the path of faith all by ourselves. His Word guides us and the Holy Spirit directs our understanding so that we can have a close relationship with God. I remember the first and only time I heard the audible voice of God. It’s one of those things you just tend to remember. But I don’t think you have to be as desperate as I was to hear the voice of God. In fact, I think God had spoken to me an insurmountable number of times before this moment, just in a quieter voice. It was here, where I really heard Him: McClintock’s dormitory floor at the University of South Carolina during the biggest game of the season. I had a fantastic job, wonderful friends, and a full social life. I was miserable, lonely, and heartbroken. <Insert the most hysterical college girl freakout moment you can think of and your imagination probably falls short of my reality>. I replayed the words in my mind, although they didn’t have the same ring. I had heard the voice aloud. I was remembering the echo internally. I had encountered the living God. What God speaks He creates (check out Genesis for details). And He had done the same in me in one moment. I attended a youth conference as a group leader in the weeks that followed this experience and as we were worshiping the first night, I realized that I was singing the words, but I had very little connection to them or to Him because I was so focused on how miserable I was. A woman preached that night. I walked down to the front of the room. I got down with my face to the ground. It was not a radical experience, although I believe in those, my moment was quiet. I had a thought after that statement, and it came so quickly it was just like breathing. The thought was take a year of singleness. The thought had not entered into my mind before that moment and seemed to be covered in peace. I said yes. I use these two stories because it really covers some of the basic ways the Holy Spirit speaks. The Spirit speaks audibly, in a quiet voice, and sometimes in a voice that is so internal it seems like it is your own thought. But somehow, you know that it isn’t. It sounds clearer or purer or higher. It sounds like a kiss on the lips from someone you love. And as you walk in greater fullness of the renewed mind that you receive when you believe, you have more thoughts that sound like Him because we have been given the mind of Christ. Sometimes, however, the Holy Spirit speaks in a tangible or visual way. When your mind gets renewed and transformed, you have the mind of Christ. Your thoughts are like His thoughts. When you remain in right relationship with Him, you hear Him speak because He is speaking in your heart and in between your ears. “But when he, the spirit of truth comes, he will guide you into all the truth; he will not speak on his own, he will only speak what he hears, and he will tell you what is yet to come” (John 14:26). The Holy Spirit speaks, not only in words, but in dreams and visions as well. Just three weeks ago, I was driving to work praying for a student, when an image of the way that student would be healed came to mind. I saw it as if I was watching a daydream. Later that day, he was healed miraculously, by the exact same way that I saw it happen on the way to school. The miracle happened in my classroom and I was able to be apart of God’s plan for healing. It was incredible. Sometimes the Spirit speaks in a physical presence. I experience this the most when I am in my car. I am usually half asleep in the mornings and suddenly I will get this full-body-chills-sensation that feels like a bucket of chill bumps are being poured from the top of my head all the way through my legs. The Spirit’s presence is heavy and light at the same time. It feels like joy and love have filled the space. I will sometimes have this sensation several times in a single car ride to school. I have even experienced this in the middle of a store or even in the middle of a lesson before. The Spirit wants us to always be comforted and to know that we are never, ever alone or without power. I pray on the way to school, but my prayer looks different now than it did just two years ago. I no longer talk to Him like He isn’t there, but I pray with the Spirit. What I mean is that I sit with the Spirit and have a sort of conversation in images and sometimes words. I will see something I haven’t seen before in my mind’s eye-- an image that is very specific-- and then the Holy Spirit will reveal to me what it means. It is much like “praying without ceasing”. I don’t really turn this conversation on and off, it just sort of happens unconsciously now throughout the entire day. Ultimately, visuals and sensations can sound strange for some people. I definitely have not experienced both of them throughout my entire journey. But these are some of my favorite and often, most clear, forms of hearing from Him. The final way that we can hear from Him is through His written word. It is very important that we spend time soaking in His written word because it helps us discern and tune our hearts and minds to Him. You can somewhat think of it like a classroom. You have the written word, the textbook. You have the Holy Spirit, an actual teacher who is physically present with you. And the Holy Spirit is much more like Ms Frizzle from The Magic School Bus rather than the one who is about to retire. This teacher isn’t giving you the same old recycled mess. The Holy Spirit helps you understand and keep in memory what is in the textbook, but will take you on actual adventures that give you experiences to connect with those lessons you learned in the book. This is the dynamic duo. But it’s also good to have studious classmates who can help you learn as well as mentors who already took the “class” you’re in. Just as much as it’s important for you to have someone you are tutoring because helping someone else learn ultimately makes the material more clear for you. This is the holistic environment in which we hear and discern His voice. The concept that God speaks, that He is capable of being heard, has always been part of my comprehension of His character. I come from a rich heritage of faith, where the saving and redeeming blood of Christ has always been taught and mostly accepted. I grew up believing that God spoke to His children. I just never planned on hearing His voice. I somehow felt excluded from the group of God Hearers, as if one needed to be a Biblical scholar or theologian to be deemed worthy of hearing the voice of God. So when He spoke to me, clearly and quietly, I listened. I thought I was insane. No louder than a whisper, but as powerful as a bellowing declaration, His voice resonated within me. In that moment, there was no doubt that God was the one speaking. I had heard my own thoughts before and they were never delivered with such authority, such peace. I was excited and terrified. I had always talked to God, but hearing His voice was a sweet reminder that I was in a relationship with Him. I wasn’t just talking to the ceiling or spewing words into the air around me. God was listening and He cared enough to respond. I assure you that I don’t follow a magic formula to bargain for the sound of His voice. I simply spend time with Him. Because I want to know His heart, I make it a priority to read His Word and pray. I take breaks from social media and other distractions and I set aside time to just be with God. But most importantly, I give God the opportunity to speak. I no longer limit Him and His ability to work in my life by the way that I view myself, thinking that I am too young or too insignificant. I’m not excluded from the group of God Hearers. And neither are you, friends. I pray that you would give God the opportunity to speak in your lives. I’m sure that He has some amazing things to say. Last fall, I found myself facing debilitating anxiety for the first time in my life. Sleepless nights, racing heart, impending sense of doom…these were all symptoms I carried with me for weeks. True to my nature, I didn’t share what was going on with anyone (not even my husband, although he could tell something was not right). I hid away from the world, only going out for work and church- until I began creating excuses to miss both. There were certainly many factors leading to the state in which I found myself- a husband in his final year of law school, mounting debt due to said law school, a job I dreaded going to every day, and some delicate concerns with close family members. Every moment was filled with constant obsession of each issue. Short of requesting medication, I was lost for help. I’ve never been the type who believed in God “speaking” to me. Sure, I trusted He would lead me when I sought Him; I knew I would grow in my faith by the means of grace provided (prayer, faithful preaching of scripture, partaking of communion). However, I didn’t trust I could open the word, listen to a sermon, or read a devotion which would directly speak to me. I did not seek out this verse- it found me in two very different ways, on the same day. And this produced an understanding of how the Lord speaks to me - to all of us…through His word. When we are in doubt, when we are in fear, we need to flee to the comfort of the very voice of our God. We need to trust when we listen to a faithfully preached sermon with open ears, we will hear our God whisper directly to our own hearts. I know it seems simple- look to scripture. And how silly I am only now grasping this, after being a believer for a great number of years! Since the day of Isaiah 41, I have made a conscious effort before sermons and my own quiet time, to pray the Lord would keep my ears and heart open to what He would have me hear…keeping my mind clear of what I want to hear, and being open to what He has to say to me. Daughter to a glorious King, wife to a remarkable man, and mama to a high-spirited puggle. She loves all things feminine and sparkly, and has a desire to master the fine art of being an elegant lady. Literature and music are the background décor of her life - and Phillipians Four is her refrain. She hopes to express the grace, beauty and faith she cherishes in her own world through her words. You can find her on instagram and her blog. You would think that a girl like me would know all about listening to God. I grew up in a Christian home going to evangelical churches all my days. I was the good Christian girl who went to camp as a kid and rededicated her life every year around the campfire. As a teen and young adult I worked at camp, taught clubs and Sunday school, went to Bible college and everything. I was really good at all the Christian ‘things’, or so I thought. Then I got married to this guy who had something going on with God that I had never seen before. It was like he had this ongoing conversation with someone happening in a constant fluid stream inside his head and no he wasn’t schizophrenic! He talked to God and apparently God was speaking back to him…all the time. He saw listening prayer modelled for him as a teenager when a new pastor came to his home church. He was hungry for what that pastor had and so he started searching, because, like me, he had the same sort of upbringing; conservative, evangelical doctrine which kind of left the Holy Spirit out for the most part. When we got married I was fascinated by the relationship that my new husband had with God, I had never seen anything like it and I wanted it myself. We started going to Passion for Jesus conferences and anywhere where there was teaching on the Holy Spirit and a passionate relationship with Him. I realized that while God didn’t speak to me in the constant stream that my husband seemed to have, I ‘heard’ him more in other ways; through dreams, pictures, a word here or there of something that I needed to know, music and more. God was speaking to me, I just hadn’t chosen to listen or seek it out, He’d been talking to me all along the way and I wasn’t aware! Since that time there have definitely been times when it seems God is silent. Sometimes this is because He has already said what needs to be said and I need to obey. Sometimes it is because I am not really willing to hear whatever it is he is trying to communicate or my heart is far from him due to sin or indifference. As a children’s pastor (back in the day) I wanted the kids that I was influencing to hear God for themselves so I sought out a model that I could use to teach them, we still use the following model to teach our own kids to hear God. One model for listening prayer that we have really appreciated and taught is a variation on a format from King’s Kids, a simple approach to help kids listen, discern and understand God speaking to them. We have usually done this in a group but it can be done by an individual as well. Write down anything that crosses your consciousness – a word, a color, scripture, song lyrics, etc. Share these things all together with the group. Again, ask the Holy Spirit to show you what you need to know and start discerning how each piece of that puzzle fits with the question asked. Thank the Holy Spirit for the direction or light given, see if there is more. Write down whatever conclusions or directions you came to and then be obedient to what was shown. Don’t worry if you don’t ‘get’ anything. This isn’t the only model for listening prayer but it is one that we have used over and over again to discern what we need to know about a situation, a direction we’re considering or some gray area. God’s direction will always line up with his word, it will not contradict it, nor will it lead us into sin. It doesn’t need to be a big, scary, mystical event. It does, however, involve our own humble spirit and the willingness to wait on him, trusting that he will, indeed, speak to us in a way that makes sense for us as an individual. We will each hear God differently. My husband is very audio, I am very visual. The blog that I used to run, Fresh Flowers, was all about hearing God in the everyday. Every week I shared about how God was speaking to me in the everyday stuff of life. That period of time, where I was regularly seeking out God’s very practical voice was a rich spiritual time in my life. (if you want to go read the archives you can find them here) I was always seeking and he was always speaking. In the season of my life that I am in now I don’t hear him that particular way but every now and then I still find ‘flowers’! Let me tell you one story about hearing God and seeing the fruit of that coming to light. We felt like we needed to sell our house and move back into the city (because of a question that a dear friend felt prompted by the Lord to ask us). In my prayer time I felt like God was giving me some very direct instructions and a clear picture of what was going to happen with our house, the purpose of which was that we would know that this was His plan and not ours, for his glory and not ours. He sent me around the house praying for seven days (yes I felt somewhat foolish but decided obedience was a good idea). He said that the 11th person who looked at the house would be the one who would buy it. We kept track of the realtor cards and numbered them so that we couldn’t ‘cheat’. The 10th and 11th people came on the same day. The 10th were a sweet family and our house and huge yard seemed like a perfect fit. The 11th was a single lady, the house seemed so huge for just one person. We thought maybe we’d heard wrong. Surely it would be the sweet family that would buy our house. A day or two later the offer came from the single lady, #11, cash deal, no conditions, full asking price…SOLD! Exactly the way the Lord said it would. I go back to this rock of remembrance time and time again when I doubt that I can hear God’s voice, when I wonder if he’s real or if he is concerned about my well-being and the details of our lives. He didn’t have to show me any of that, but he did, because he loves us and longs to communicate with us. That example of his direct intervention in my life has shown me over and over again that he is a personal God, faithful and interested. Why wouldn’t I want to talk to him and hear what he has to say! Trust that he knows how to communicate with you and wait. Lani is a blogger over at allthiscrazygrace.com. She is the mom of 6 kids and the wife of a farmer/musicianary. When she isn’t blogging or homeschooling or cooking or driving somewhere she goes to her happy place which is loaded up with fabric therapy materials! You can see what she is up to on her Instagram. “I’m supposed to write a piece about hearing God’s voice for a lady I met at the Allume conference,” I mentioned to my mom as we walked up the hill near my grandfather’s house. The cool air chilled my ears and tingled my nose, a great cover for the tears that threatened as doubt clouded my mind. “I think that’s exactly what you write,” my mom answered, turning to look at me. For a while it seemed I heard the Lord’s voice everywhere – on morning jogs, in the stream that followed my path, the yield sign, the sunrise, the morning dew on the grass, and even in the shower. I felt His whispers of truth spoken to my heart in the everyday parables of life. He spoke and provided funds for our family of five to travel back there in May of last year. Then He clearly called us home and to say Good-bye to our church friends as they packed up on the mission trip without us. His Words were so clear. But after that, things got quiet. I would jog and look for His message to me in the sunrise or hidden on the road that I traveled. Yet I only heard the pounding of my feet mixed with the singing of the birds. I took long showers, waiting for the gently whisper in heart, the sweet breath of my Savior. I would sense a few things. Nothing stood out to me in bold letters as it used to. I would pray, “Lord, is that you? Or just my thoughts.” I was never really sure. In my journal I expressed my hurts, confessed my inabilities and asked for Him to fill my voids and direct my steps, even in the quiet. In November, our family had to make two of the toughest and weightiest decisions I think we’ve ever made. Decisions that affected our whole family, either way we decided. There were no best case scenarios. It’s like we needed to make a prize winning book shelf out of scrap wood and make-shift hammers. We just decided to do what seemed best. There was no booming voice of God telling us “walk this way.” The only “word” I got was to trust that He carries my burdens - daily. He promises to be with me wherever I go. I prayed I would see His footprints guiding my path. I can’t say that His footprints were clearly visible in the decision making process. But as we’ve walked out those decisions, I now see the footprints. I see the bricks that He laid months before to allow me to walk easier down this road He quietly called me to. God is so real. He is real when the water is clear and things make perfect sense, and He is real when the room is dark and lonely and I don’t know what to do. He is real. And I am thankful for even the quiet times. Julie loves preparing her family’s favorite foods in the kitchen, reading compelling stories in the living room and admiring God’s sunrises every morning over the fields. She and her husband live in East Texas and own their own business, Southwest Metal Systems where they get the privilege to construct people’s dream houses, business and horse barns. She finds joy in life’s simple illustrations and writes about them on her blog, juliesteck.com, guest posts at beyondthenook.com or for their business at Ameristall. This past spring and summer I read two books that made me long for a closer connection with God. I wanted so badly to be more in tune with the Holy Spirit. I wanted to know Him, like really know Him. After reading those books, I began praying that I would hear Him more often and more clearly. I prayed that I would be open to and aware of the Holy Spirit so that God could work through me. One of the biggest ways God speaks to me is through His scriptures. What I have found, especially this past year, is how when I lean into God and ask Him to speak to me, He does. There have been so many times that I have been struggling in a certain area or with a certain decision, and when I open my Bible the verses speak to that situation exactly. One of those times was in June of this past year. I was feeling incredibly discouraged by the darkness that seemed to be taking over the world. Just watch the news for a couple days and it's easy to feel this way. It was making me feel sad, sick, and overwhelmed. One day I was feeling especially discouraged and happened to be reading Leviticus 18 as I was working through the Old Testament. After reading this, I was reminded of all the natural disasters that had happened recently, especially earthquakes. I felt fearful of what could happen -- of the land vomiting us out and how possible and even probable it is. I began praying after reading that scripture. I told God how sorry I was for all the things us humans are doing, accepting, and even celebrating in this place He created for us. I asked God that if the land vomits its inhabitants that He would remember those of us who are trying to obey Him, trying to stand up for what's right, trying to have eyes focused on Him and clean, pure hearts. I asked that He remember us -- no matter how few -- and protect us. A few days later, it was time for me to read Leviticus 26. I love verses 3-6, 9, and 11. But what really stood out to me was verses 40-42. "They will pay for their sins because they rejected my laws and abhorred my decrees. I was amazed that I had asked God to remember me and those of us trying to please Him, and here just a few chapters later He told me He will remember. God reassured me. He told me He heard my prayer and He would remember. I couldn't help but wonder if He knew back when He first said that in the Bible -- thousands of years before I even existed -- that He was saying it to me too. I think He did know that. Because He's big -- so big we could never even wrap our tiny minds around it all. I began reading Leviticus thinking I would gain nothing, yet asking God to teach me. It just shows that when we really ask God to reveal Himself, ask His Holy Spirit to fill us -- well, that's one powerful prayer -- one He loves to answer! I can't say I've ever heard an audible voice and known it was God. There's no booming, deep voice that speaks to me. That might be the case for some people, and that would make following God's guidance much easier. But I think God likes it when I take the time to truly listen, when I take the time to search for Him and dig deeper to see what He could be saying. I encourage you to ask Him to reveal Himself and see how He answers, because I guarantee He will. Tiffany Stroud blogs at Seeing Sunshine about faith, family, military life, and homemaking. She is an Army wife, originally from Indiana, who just recently moved to Missouri. She works as a blogger, freelance writer, and virtual assistant. Tiffany loves Jesus, ice cream, and traveling, especially to places with a beach. Follow her on Facebook or Pinterest. The topic of hearing God and following the Holy Spirit has been surfacing around me. It has made me question how many people have yet to experience the voice of God, especially those who are in the church now, as well as those yet to set their hope in Jesus. I have been praying about what do to with this knowledge to bring about the awareness and beautiful intimacy that hearing God has on us and God lead me to some wonderful ladies I met through the Allume Conference,who are brave and bold and willing to share their story of how they have come to hear the voice of God through this series. It is not a list of "how tos" or of verses on hearing God or things of the sort. Just an honest, open discussion of the telling of their story. Of their journey to the place where God's voice is the one they listen to. You can find the entire series here. This is just after he says he is the good shepherd and explains that means. In some translations, John 10:27 says listen instead of hear but in order to listen, we first must be able to hear. Hearing leads to listening, which results in an option of obedience on the part of the listener. Hearing and listening changes everything. It is as though a parent asks her child to do chores but the child cannot hear due to all the noise around and therefore is not listening. The chores never get done and the child goes about his business playing. When the noise quiets down and the child is able to hear again, the parent can ask again and this time the child is listening, the parent has his attention. The results of the chores are up to the obedience of the child, since he has now heard the instruction. Hearing is a considering of what is being said and an understanding of what is spoken. It is an opening of our ears, for we are no longer deaf but able to hear God and his teachings. This definition of knowing is more than an acquaintance basis but a coming to be known and known intimately, like that of a husband and a wife, in regards to the sexual idiom used in the context. We may know someone and be on speaking terms with them but not know them fully or personally intimately. We do not know what their hearts are like or what things draws their attention or what is important to them or what keeps them up at night. God knows us like this and when we are his sheep, hearing his voice, the intimacy of relationship leads us to knowing him in this context. We can know about God but until we reach the point of intimately knowing him and listening and allowing the Holy Spirit to fill us and lead us and transform, we will live a life far from God, despite our best efforts and religious practices. Or until God gets your attention in another way. Here's to listening and hearing and knowing. The topic of hearing God and following the Holy Spirit has been surfacing around me. I have spoken with friends who have been in church their whole life and are just now learning to tune in to God's voice because they were never taught how or knew that it was possible. When I heard this, my heart broke for their loss but rejoiced in the newly tuned ears and hearts and the transformation God has in store for them. It has made me question how many people have yet to experience the voice of God, especially those who are in the church now, as well as those yet to set their hope in Jesus. It is not a list of "how tos" or of verses on hearing God or things of the sort. Just an honest, open discussion of the telling of their story. Of their journey to the place where God's voice is the one they listen to. If you have ever wondered how God speaks, if he still speaks to us, the answer is YES. How do you commune with the God of the universe? How do you discern his voice and know that it is not just a thought of your own will? How did you get to the place where you now hear God's voice leading you and guiding you on your journey? How has that changed you and your relationship with God? Is there anything you had to overcome? What disciplines (i.e. prayer / fasting / solitude) do you do in order to stay in tune with God? How do they fit in to your life style? Was there a time God told to do something you thought was crazy but was just what was needed for you or someone else? Each contributor will touch on various questions listed here and sharing whatever God has lead her to share. We are excited to dive in and see how God moves. 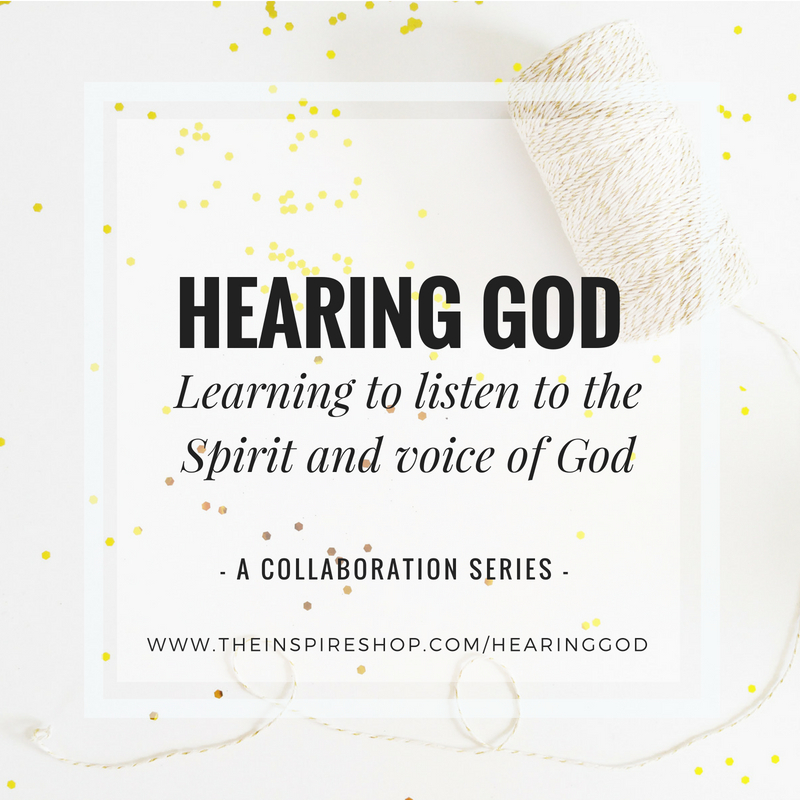 The heart of this series is for the ears of believers to be opened to the truth and intimacy that hearing God brings and the transformation that the Holy Spirit does in our lives as we quiet ourselves and listen. In the Old Testament, God spoke to Abraham and Moses and through the prophets. In the New Testament, Jesus came and spoke himself and then left his Spirit for us and is still speaking. So for the next few weeks, we will be diving in to the stories of these brave ladies in their journey to hearing God. Praying you will be blessed by them and that God will move in your life and continue to open your hearts and ears to his voice. Here's to going deeper and God adventures and listening.